Seven years ago, The Nutcracker premiered as a 20-minute lunchtime performance in the gymnasium of Sacred Hearts Academy. It has blossomed into a two-evening, full-length ballet Christmas affair onstage at Mamiya Theatre complete with snow, fog, and a holiday-themed craft and bake sale! 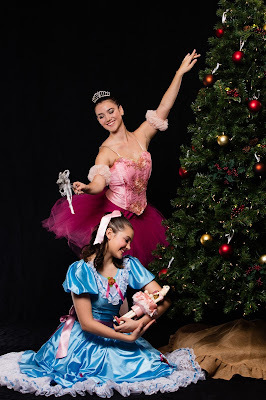 This year’s cast includes 79 dancers from grades 7-12 featuring senior Academy dancers Maya Waldrep as the Sugar Plum Fairy and Jayla Wakabayashi as the Snow Queen, and sophomore Risa Ishii as the Dewdrop Fairy. Freshman Kira Stone will dance the role of Clara the young girl who experiences a magical Christmas battling evil mice to save her Sugar Plum Fairy and dancing with delicious sweets.Performances will be held on Friday Dec. 4th at 7:00 p.m. and Saturday Dec. 5th at 7:00 p.m. at Mamiya Theatre. Tickets (reserved seating) are $10 plus processing fees at www.sacredhearts.org/tickets.